Located on Wangbur Mountain, on the southern bank of Lhasa River in Tagtse county, 57 kilometers to Lhasa, the Ganden Monastery is one of the largest Buddhist monasteries in Tibet. It was built by Tsongkhapa (1357–1419), a famous teacher of Tibetan Buddhism and the founder of Gelugpa school of Tibetan Buddhism. 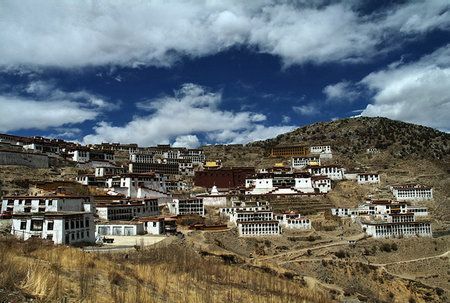 Together with the Sera Monastery and the Drepung Monastery, Ganden Monastery is one of the "Three Great Temples" in Lhasa. The Buddha Painting Unfolding Festival which is one of the grandest Buddhist activities held in the monastery attracts crowds of followers and visitors each year.